Home Why does it work? Works from the first night. 94% satisafaction rate. When you sleep, your muscles relax. This relaxing of the muscles reduces the space in the airways and therefore limits the amount of air you breathe in. To continue supply oxygen to the lungs, the airflow accelerates and the relaxed tissues start to vibrate which causes snoring sound. Sometimes the pharynx is completely obstructed which causes respiratory failure or sleep apnoea that can last for 10 seconds or more. This phenomenon can occur repeatedly several dozens or even hundreds of times a night; in such cases it is called Obstructive Sleep Apnoea Syndrome (OSAS). This sleep disorder lowers the levels of oxygen in the blood and causes many unconscious micro-awakenings. It can have serious consequences (hypertension, cancer, stroke, depression, cardiovascular disease, fatigue and sleepiness, impaired libido, etc.) which can lead to premature death. However, according to the French health authorities, 90% of people with sleep apnoea are unaware of their condition and are not treated for it. If you are suffering from sleep apnoea, we recommend that you should consult a specialist doctor. 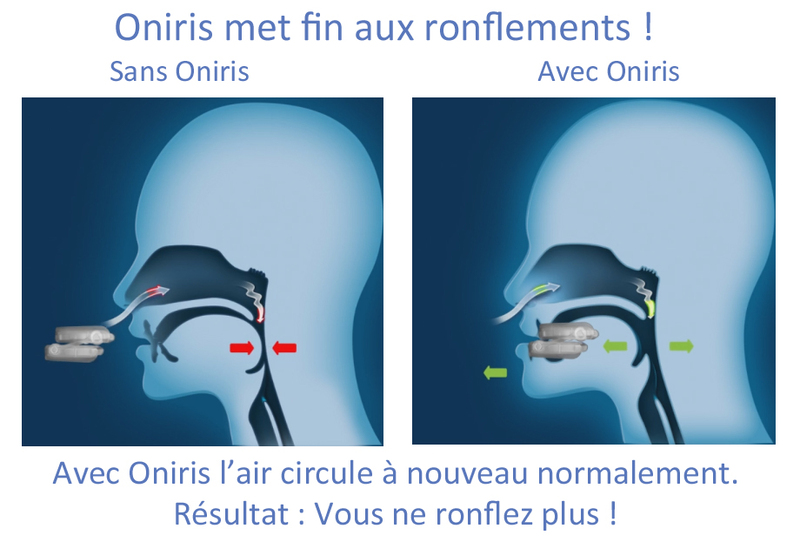 ONIRIS® is an innovative and patented mandibular advancement device designed to provide maximum levels of comfort and efficacy. The device – similar to a mouthguard for sportsmen or a dental splint – gently retains your lower jaw in a forward position during sleep. It therefore allows air to pass freely through the pharynx and prevents the obstructions that cause snoring and sleep apnoea Numerous clinical studies have shown that this technique works. ONIRIS® is the only solution to offer patients a customised fitting and total freedom of movement for a comfortable and effective adjustment. *For cases of mild to moderate sleep apnoea. For cases of sleep apnoea, mandibular advancement devices are recommended for cases of rejection or in association with continuous positive-pressure machines. For cases of sleep apnoea, seek advice from your doctor. For several decades now, clinical studies have shown that mandibular repositioning devices are effective against snoring and sleep apnoea. Of course, other treatments are available. Surgery can be effective but it is very expensive, involves risks and does not guarantee results even though it is final. Nasal dilators may help some snorers if their nasal breathing is limited but this is not the main cause of snoring. And throat lubricants (sprays or lozenges) do not work after a few minutes and in cases of very light snoring. Mandibular advancement devices are generally recommended as the first-line treatment for snoring and sleep apnoea* by American, European, Japanese, etc. Sleep Associations. * For cases of mild to moderate sleep apnoea. For cases of sleep apnoea, mandibular advancement devices are recommended for cases of rejection or in association with continuous positive-pressure machines. For cases of sleep apnoea, seek advice from your doctor. We have just seen it, mandibular advancement devices are part of the most effective and recognised treatments for snoring and sleep apnoea. There are two types: custom-made devices, made at the unit from your dental impression, taken by your dentist. And self-adjustable devices, such as Oniris. Custom-made devices are very efficient and comfortable in the long term. They fit perfectly and last for several years. Our laboratory has also specialised in their design for more than 10 years. The problem is that custom-made devices are very expensive: between £600 and £1000 in total! That is why we designed Oniris using our expertise: a self-adjustable device, accessible to all, but with an efficiency and a comfort equivalent to a custom-made device. But not all self-adjustable devices are worth it. Some do not allow you to open your mouth during the night. Others cannot be adjusted or do not fit your dental impression properly. This makes them uncomfortable to wear, and ineffective. This is not the case for ONIRIS®! Due to its technology which has been patented several times, an adjustment to the nearest millimetre and a custom-made dental impression, it fits perfectly in your mouth and gives you true freedom of movement to offer a level of comfort and efficiency comparable to a custom-made device.